The 95x cars have the name of a scenic spot under the windows: Pikes Peak for the 952 coach, Niagara Falls for the 953, and Grand Canyon for the 954. 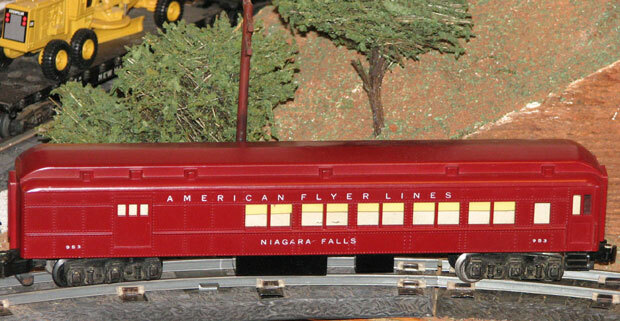 The maroon cars were made with no silhouettes in the windows in 1953 & 1954, and with silhouettes from 1955 through 1958. #952 Pikes Peak coach without silhouettes made in 1953 & 1954. #953 Niagara Falls Combination without silhouettes made in 1953 & 1954. #954 Grand Canyon Observation Car without silhouettes made in 1953 & 1954. 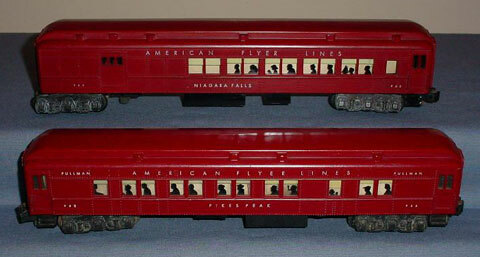 #952 Pikes Peak coach and #953 Niagara Falls Combination with silhouettes made from 1955 through 1958. #954 Grand Canyon Observation Car with silhouettes made only in 1955.